Nine months ago, I tied the knot with my newfound soul mate and best friend. The six months leading up to our nuptials were filled with excitement, anxiety and wonder about the family narrative we would write together. With the divorce rate at an all-time high and the traditional family system dissipating, I felt a concern about getting married and starting a family. I spent countless hours delving into the dynamics of our family backgrounds and discussing the impact our individual upbringings would have on our life together. What were the ingredients needed for a successful marriage and to create a happy family, and would we be successful in doing this? What legacy would we want to leave for our children and for future generations? These questions prompted me to turn inward and inquire with those around me who had a lifetime of experience and wisdom. To my surprise, a recent career shift from Jewish philanthropy to working in direct service work resulted in the cultivation of rewarding helping relationships with Holocaust survivors who have given me insight into the meaning of life and helped to answer my questions. In addition, I have learned that storytelling is a critical component in building a foundation of trust in my work with Holocaust survivors. Their willingness to share and my ability to listen and gracefully inquire are what create a harmonious helping relationship and ensure that I can provide my clients with continuity of care. For survivors of the Holocaust, the very act of retelling stories of their past contributes to their development of a strong sense of self; recalling the adversity they have overcome helps them to develop the strength and confidence necessary to move forward. As clinically trained case managers, we create the therapeutic space for these stories of trauma, love, loss, and family to take shape. These stories provide us with insight and tools to help us ensure that these courageous individuals complete their life cycle with dignity, quality care, and support, all of which were stolen from them in their earlier years. Most importantly, I have been able to take the stories of my clients and use them to help educate others on their unique needs to ensure the best care for this population of survivors. During one of my visits to my client, Mrs. R, I noticed that she had a yartzheit candle burning to commemorate the anniversary of her mother’s death, a mother she never had the opportunity to get to know well. Mrs. R was only 15 years old when her mother and father lost their land, their home, and were ripped away from her life. The unresolved grief she felt permeated through every syllable of each word she communicated to me. As she replayed the past, she was reminded of a robbed childhood and expressed how overwhelmed she was with the challenges of aging, as she never saw her own parents or relatives grow old. For many survivors, the foundation of their lives was tragic, rooted within an overwhelming sense of loss and feeling of abandonment. For Mrs R., “old age elicit[s] a recapitulation of Holocaust experiences and the life cycle of aging [is] experienced as highly traumatic (Davidson, 1980).” Normal challenges of aging, such as physical decline, isolation, diminishing community of neighbors and friends, and geographic separation from children are constant reminders of the Holocaust. Many moved forward fast with a strong desire to re-create their own family narrative, as theirs was stripped from them. For some, the tragedy of the Holocaust is at the forefront of their identities. For others, still, it represents a past not explored. 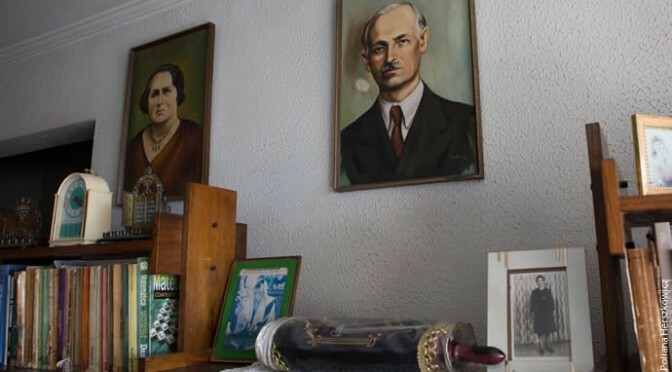 As this population of strong Holocaust survivors ages, they attempt to make sense of their life course, negotiating their path and reviewing their life story. As I sat in Mrs. R’s living room and joined her in the age old Jewish tradition of lighting the yartzheit candle, I felt saddened for her loss, yet comforted knowing that I was helping to provide her with support and guidance. Although I could not resolve the loss she experienced, I reminded her of how her own narratives of strength and resilience have helped her develop adaptive coping skills to enable her to age gracefully. Because of my ability to develop a strong rapport with her, Mrs. R. felt comfortable around me and was able to open up about herself, her life, and her past. I believe it was this moment when Mrs. R knew she had the confidence to trust me. Mrs. R has various physical ailments that have worsened with her age and were caused by the years of malnourishment and torturous conditions imposed during the war, impacting her ability to currently function independently. At first, she was reluctant to share her conditions with others. I now know that this was due to the fact that Mrs. R never saw her parents age; she never took care of elderly family members, and she never interacted with the elderly in her community as they were all taken from her in the Holocaust. Nevertheless, through my interactions with Mrs. R. and because of the trust we built together, Mrs. R is able to engage in a healing process through storytelling. In my ongoing work with Mrs. R, she can remember horrific stories of the Holocaust as though she lived them yesterday. She speaks of the labor she was forced to do in concentration camps and how being able-bodied determined whether you lived or died. She tells me about the death marches in which she was forced to stand on her feet for days on end in the middle of winter. As Mrs. R. deteriorates physically, she is fearful of how those around her will treat her as a result of what it meant to be “old and weak during the war.” Her oral and digestive health has been compromised and only worsens with age. She experiences numbness in her toes and fingers as a result of the frost bite she contracted from the cold conditions in Europe. Her complicated medical conditions prevent her from being able to administer and engage in daily activities, such as grocery shopping, meal preparation, and driving. At times, her life becomes prohibitively expensive to manage. Despite the obvious tragedy of Mrs. R’s personal narrative, her stories of survival help me understand who she is as a person and why she displays resistance toward reaching out for help or accepting assistance. I spend countless hours talking with Mrs. R to support her in developing a greater understanding of her strengths and how these strengths, based on the stories she tells, has and will continue to enable her to optimize and maintain her independence for as long as possible. Through our work, I was able to introduce her to the idea of having a companion to assist her for a few days throughout the week. I connected her to a companion, ensured that this new transition was seamless, and that Mrs. R received the supports she deserved. Knowing that I was there to stay helped Mrs. R to accept help, as she knew she would always have me to discuss any issues and problems. As I continue to monitor the situation, I share parts of Mrs. R’s stories, with her permission, with her companions as well as with others who assist her. In this way, helping the companions better understand the importance of their work helps improve Mrs. R’s quality of life. On a recent visit, Mrs. R stopped me as I was leaving her apartment and began to cry as she informed me that she missed her children and felt overwhelmed by loneliness at times. Mrs. R lives alone in a single family home she purchased with her husband over twenty years ago. She has two children who live out of state and that she only sees a few times a year. She has spent the last seven years widowed, watching her friends and neighbors move into skilled nursing facilities, pass away or move back up north to be closer to their children. These losses trigger feelings of re-victimization for Mrs. R, leaving her feeling vulnerable, lost, out of control, abandoned, and desperate for human connection. As her advocate, I linked Mrs. R to formal mental health services at the agency in order to guarantee that she continues to work toward healing her emotional “wounds.” I connected her with the agency’s Friendly Visitors program and have encouraged her to attend our socialization annual Café Europa and monthly Eat & Schmooze events to remind her that she belongs to a community and has a network of people who care about her. As a compassionate professional, I take the time to listen to her stories, try to abate some of her abandonment feelings, and indicate just how meaningful her narratives are to enhancing my understanding of her experiences and the atrocities that occurred during the Holocaust. These stories and our visits are emotional and heartfelt. Through storytelling of her traumatic past experiences, I believe that both Mrs. R and I continue to develop as individuals. Most importantly, I have come to learn that storytelling, listening, human interaction – even a simple smile – is irreplaceable as part of the healing narrative. In today’s society, human connection is compromised, as technology has become the popular mode through which family stories are being told. Present generations are creating community and expressing their personal narratives through programs, such as Facebook, Twitter, blogs, and Instagram. While these outlets provide creative ways of scrapbooking one’s life, they cannot replace real human interaction. Mrs. R and many other Holocaust survivors have reminded me of the value in taking the time to connect face to face, devoid of technology. Through human interaction, we disconnect from our dependency on technology and practice interacting in a way that communicates emotion, develops empathetic listening skills, and conveys the importance of human touch. As I embark on my next journey, I will remember Mrs. R’s stories of life, love, loss, and think of my own need to belong into the fabric of my family narrative. I would like to ensure that Mrs. R’s legacy, as well as those of my other clients, live on through me. Author and award-winning storyteller, Laura Simms asserted recently in a workshop that, “a story can give someone the inner practice of being able to deal with strong emotions and difficult situations and begin to be able to envision a future (as cited in Thacker, 2013).” I am comforted in knowing that, if Mrs. R could move on from the tragedy of the Holocaust, I too can withstand the challenges that will come my way and embrace them as trials that will help me to develop my own adaptive coping skills and unique narrative. survivors. Journal of Marital and Family Therapy, 6, 11-21. Levine, Joanne. (2001) Working with victims of Persecution: Lessons from Holocaust survivors. Social Work Journal, 46, (4) 350-60.